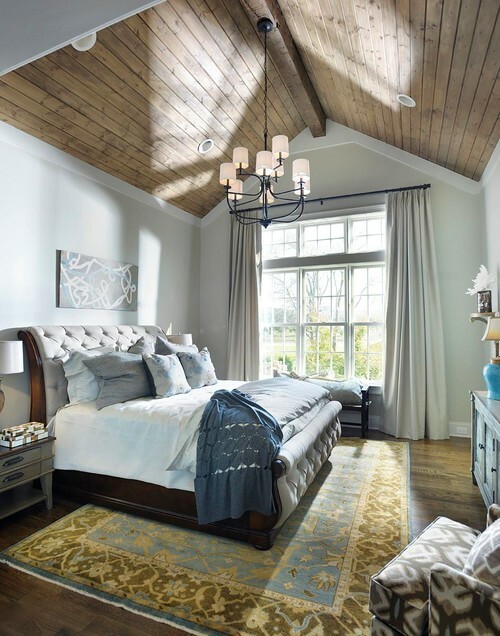 Bringing Rustic Charm Home with Wood Ceilings | Wood. It's Real. | Wood. It's Real. One of the more popular design aesthetics you see these days are homes incorporating rustic charm. Interestingly, these rustic interiors use the ceiling as an essential design feature. No longer a blank white surface, adding wooden details to ceiling creates ambiance, texture, and an added layer of the overall design of a home. Whether you are looking to craft the perfect log home, rustic modern farmhouse, or a cottage-style home, Southern Yellow Pine is the ideal material for your ceiling project. The beauty of Southern Pine is in how well it lends itself to a natural finish, with beautiful grain and knots that give that quintessential rustic feel. You can incorporate the wood in many styles of homes. If your home has a log, camp, or cabin feel, Southern Pine is an excellent choice for your ceilings. You might consider tongue and groove across a vaulted ceiling with rough-hewn timbers as accents. You could also add decorative ceiling beams in a natural finish for your rustic home. If your color palette calls for a darker wood, Southern Yellow Pine is ideal for staining because it retains that beautiful grain pattern that is a signature of this wood species. For a crisp look in your home, you might consider a painted wood ceiling. Popular colors for painted wood are classic white or cream colors. Some people add a subtle robin’s egg blue color to their ceilings, often with white trim. If your style is more of a cottage or farmhouse design, painted wood ceilings can brighten up spaces and make small rooms feel larger. Southern Yellow Pine is a dense wood, allowing it to be held by fasteners better, making it an optimal material for ceiling application. The Rustic Collection: Solid Southern Yellow Pine boards made and sustainably grown in the USA. A huge trend in design is shiplap application of wood. This choice is excellent for that rustic modern flair you are looking for in your home. You can use this as a standalone design or incorporate engaged beams to add visual interest through repetition. 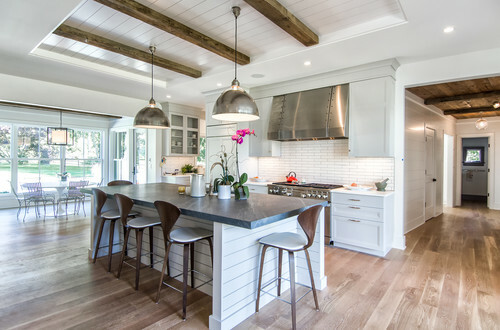 Many homeowners paint their wood ceilings all one color, while others paint beams and planks two different tones to create a dynamic ceiling design. Prefinished Wood Accents: The planks are prefinished, so there’s no on-site sanding, staining, or sealing needed. For many homeowners, the design of their wood ceiling is a focal point and an important architectural feature. Given that your ceiling is one of the most extensive uninterrupted surfaces in a room, the design and scale of it can set the whole feel of your space. Many people find that a combination of paint and stain (or natural wood) is an excellent design choice that gives their home a rustic look they love. One classic design choice is painting wooden slats and leaving the natural finish to any beams or exposed trusses. If you are planning on a coffered ceiling design, you might consider painting the beams that create the coffers and leaving the natural finish of the Southern Yellow Pine to the flat indentations. If you have painted wood trim throughout the walls of your home but want a natural or stained ceiling, you might incorporate painted crown molding as a refined rustic design and a stained plank ceiling. Whether you decide on a natural finish, stain, paint, or a combination of finishes, a Southern Yellow Pine wood ceiling is sure to add charm, character, and a rustic design flair to your space. 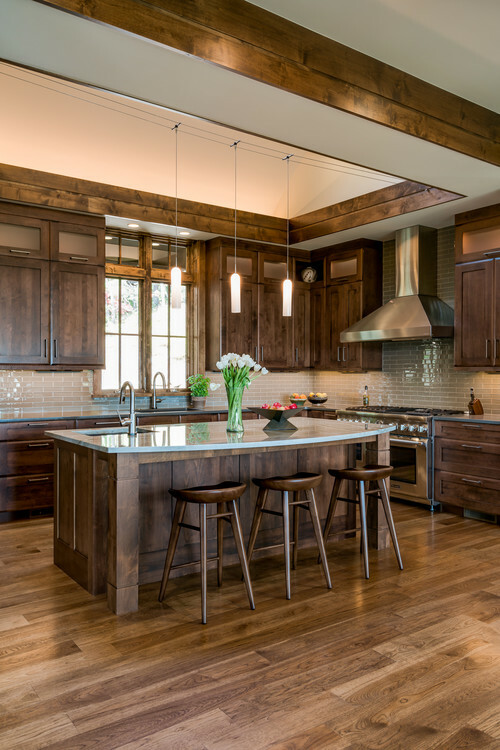 Images via The Rustic Collection, via Prefinished Wood Accents, via Houzz, via Wood. It’s Real. Cocktail Garden Bar Plans. Yes! Pining for a Drink? We’ve got you.